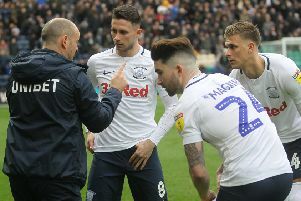 Preston boss Alex Neil has called for prison sentences and a zero tolerance to fans who invade the pitch to attack players. Neil labelled the assault on Aston Villa midfielder Jack Grealish by a Birmingham City supporter in Sunday’s derby as ‘disgusting’ and says stern action needs taking to make sure there is no repeat. Last Friday night, a Hibs fan ran on the pitch at Easter Road to push Rangers defender James Tavernier. There was a pitch invader too during Arsenal’s game with Manchester United on Sunday who confronted Chris Smalling. “The Birmingham one was disgusting, that is the worst I’ve seen in recent memory,” said Neil. “Credit to Jack, he jumped up, got on with it and scored the winning goal. “That was the perfect way to respond to that sort of thing. “It seems to be a bit of an epidemic happening across the UK. “Scotland has been bad for it recently and it has started to creep into England. “For me, there has to be a zero tolerance. “If you come on and attack a player there has to be a jail sentence. “I think banning them from the game is just not enough. “To do this to a guy who is just plying his trade, doing his job, is wrong. “There has to be severe punishment so the other ones looking at it think ‘I don’t want to be part of that’. “I think the only way to do that is by having jail time. “At a pop concert with a singer, if someone ran on the stage and assaulted them, they would go to jail. “So what is different with a footballer playing football? “They are trying to entertain and play as well as they can, yet you have got idiots running on to the pitch trying to attack them. Neil doesn’t think a ring of security around the pitch is the answer either. “I don’t agree with there needing to be more stewards,” said the PNE boss. “What are you going to have, 1,000 stewards stood around the side of the ground? It is Birmingham who are the next visitors to Deepdale on Saturday. They have sold more than 5,000 of their ticket allocation.